Dr. Silvia Colombo is Head of the Mediterranean and Middle East Programme at IAI. She is an expert on Middle Eastern politics and in this capacity she is working on Euro-Mediterranean cooperation, transatlantic relations in the Mediterranean and domestic and regional politics in the Arab World. Among her research interests there are also the relations between the European Union and the countries of the Gulf Cooperation Council (GCC). She speaks Arabic fluently and has travelled extensively in the Middle Eastern region. Silvia is also professor and module director in Mediterranean Regional Integration and Transformation at CIFE in Nice (France). 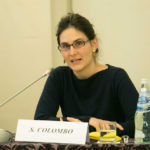 She holds a Ph.D. in Comparative Politics from the Scuola Normale Superiore of Pisa and a Master’s Degree in Near and Middle Eastern Studies from the School of Oriental and African Studies (SOAS) in London. Colombo, S. (2018), Political & Institutional Transition in North Africa: Egypt & Tunisia in Comparative Perspective, Routledge, London, UK. Colombo, S. and B. Voltolini (50% each) (2018), “The EU and Islamist parties in Tunisia and Egypt after the Arab uprisings: A story of selective engagement”, Mediterranean Politics, Vol. 23, Issue 1, January 2018, pp. 83-102. Colombo, S. and Natalia Shapovalova (50% each) (2018), “The European Neighbourhood Policy promotion of civil society” in T. Schumacher, A. Marchetti and T. Demmelhuber, The Routledge Handbook on the European Neighbourhood Policy. Colombo, S. and E. Ragab (eds.) (2018), Foreign Relations of the GCC Countries amid Shifting Global and Regional Dynamics, Routledge, London, UK. Colombo, S. and B. Voltolini (50% each) (2017), The EU’s engagement with ‘moderate’ political Islam: The case of Ennahda, LSE Middle East Centre papers series, 19, LSE Middle East Centre, London, UK. Colombo, S. and E. Ragab (eds.) (2017), Foreign Relations of the GCC Countries amid Shifting Global and Regional Dynamics, Special Issue The International Spectator, Vol. 52, No. 2, June 2017. Colombo, S. (2016), “The Trajectory of the Crises in the Mediterranean” in A. Marrone and M. Nones, Italy and Security in the Mediterranean, IAI Research Papers, pp.11-23. Colombo, S. and N. Tocci (eds.) (2011), The Challenges of State Sustainability in the Mediterranean, IAI Research Papers No. 3, September 2011, Rome: Edizioni Nuova Cultura.